A pyramid packed with features that will stimulate baby's sensory development! Sophie la girafe and 3 brightly coloured sea animals to stack up on the surfboard to develop baby's dexterity, fine motor skills and logical reasoning. 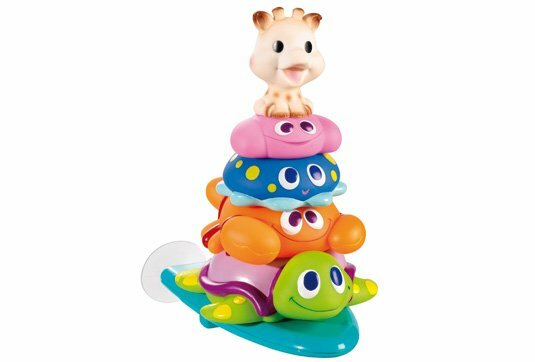 These fun animals also float, providing plenty of bathtime fun and encouraging imaginative play. Their rounded shape makes them easy to grasp, handle and slide onto the pole. The surfboard-shaped base is cleverly designed with two suction pads that can be used to stick it easily and firmly to the bath.